If you’re like me, part of the main reason you watch the Emmy’s is so that you can drool over the gowns dream of wearing. One thing is certain, they always keep it sophisticated and classy. The Met Gala is always exiting for fashion gazing also, but it’s a night and day difference in style from the Emmy’s. Here is my top 5 favorite looks from this year’s Emmys, and I have found similar pieces for you to shop just in case you have some fancy attire-worth event in your future! Get This Deep Plunge Dress From Lavish Alice For $103.00 Here. Get This Deep V Gown By Alex Perry For $706.00 Here. Get This Metallic Silver StrapPy Sandals By Retilthrpy For $38.93 Here. 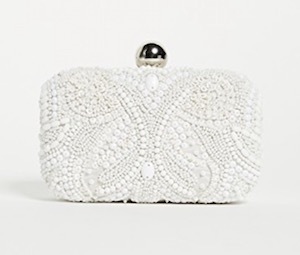 Get This Box Clutch with Embroidery And Beading By Santi For $195.00 Here.